Bamboo rafting is a full day program from morning 8AM to 5PM. 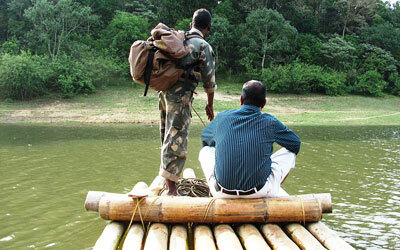 Each team comprising ten tourists will be accompanied by an armed forest guard and four guides. This tour covers cardamom, pepper, coffee and tea plantations, tea factories, tribal settlements and the surrounding hill regions. When on this tour you will also get the opportunity to explore the plantations as well as the rural village life. Telephone number: 91-486-322620. 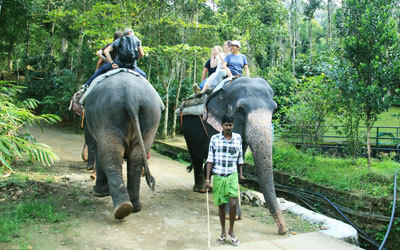 The forest Department of Thekkady offers facilities for elephant rides through the jungle. The visitors would be seated on an elephant top and would be taken around the spectacular Periyar National Park for a one of its kind experience. Time: 1000 to 1700 hrs. Duration of a trip: 30 minutes Fare: Rs. 350 per person. Tickets are available from the wildlife information Counter. Main trekking areas in Thekkady: Kurisumala near Kumily, Pullumedu, Ottakathalamedu: 5 km from Kumily, Grampi near Vandiperiyar. The Forest Department conducts daily treks from the boat landing station at Thekkady to the Nellikkampetty area and Manakkavala. Get the chance to trek up to the heights of 1500 meters and if lucky you could also get to see the wildlife here. Starting Time: 0700 hrs. Fare Rs. 10 + entrance fee. Booking can be made with the Wildlife Preservation Officer, Thekkady Ph : 322027 322028. 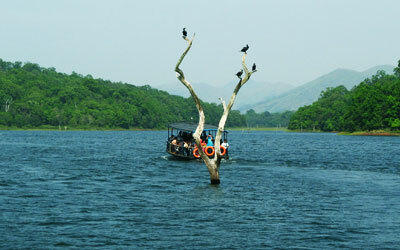 Cruise through the Periyar Lake and explore the greenery and beauty of the lake surroundings. The cruise through the calm and peaceful lake is sure to make you feel out of the world. The cruise would relax and refresh your nerves. Cruise Time: 07:30AM, 09:30AM, 11:15AM, 1:45PM, 3:30PM hrs. Fare: Lower deck: Rs 25 + 10 (entrance fee) Upper deck: 50 + 10 (entrance fee). Kumily : 4 km , Sabarimala via Pullumedu : 50 km, Idukki : 65 km, Munnar 106 km , Kumarakom 128 km, Sabarimala via Erumeli : 134 km, Kodaikanal : 149 km, Alappuzha : 164 km, Kollam : 220 km , Ooty : 390 km. Ernakulam 0700, 1330, 1515, 1630, 1715, 1930 hrs. 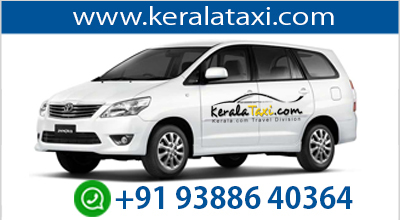 Thiruvananthapuram From Kumily - 0840, 1530, 1615 hrs From Thekkady - 0820, 1515 hrs. Madurai 0115, 0515, 0525, 0645, 0716, 0720, 0730, 0755, 0835, 0940, 1030, 1045,1120, 1155 hrs. 1300, 1315, 1320, 1420, 1515, 1540, 1550, 1650, 1705, 1800, 1840, 1905, 2045 hrs. Trichy 0855, 1045, 1925 hrs. Palani 0930, 1135, 1830, 1850 hrs. EXCURSION FROM THEKKADY : Peermede Accomodation. Peermede, the famous plantation town, takes its name from Peer Mohammed, Sufi saint and close associate of the erstwhile royal family of Travancore. Wide vistas of tea, cardamom, rubber and coffee plantations interspersed with silver cascades, sculptural rocks, meadows and mist-cloaked hilltops make Peermede an unforgettable experience. The most delightful trekking trails complement the panoramic landscape. Monuments like the summer palace and summer residence of the royal family add to the splendour of the land. The summer residence, now converted into a government guest house under the Department of Tourism, offers comfortable . Peermede and surrounding areas are ideal for trekking, cycling and horse riding. Trekking sites : Perru Hills, Kalthotti, Vagamon, Karandakapara Hills, Grampi (Paruthupara), Memala. Trips to Meloram, Nallathanni, Panchalimedu, Valanjamkanam waterfalls etc. Ernakulam : 0800, 1415, 1715 hrs. Madurai : Frequent buses from Kumily. One of the most popular hill stations in India, Munnar is situated at the confluence of three mountain streams - Mudrapuzha, Nallathanni and Kundala. Located at 1600 M above sea level, this was once the summer resort of the erstwhile British Government in South India. 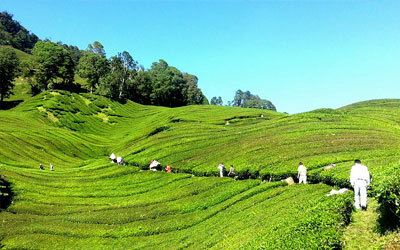 Sprawling tea plantations, picture book towns. 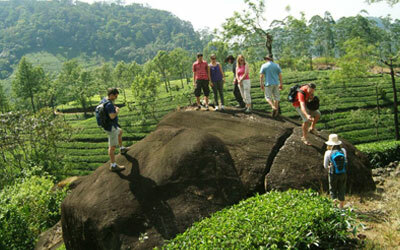 winding lanes, trekking and holiday facilities make Munnar a unique experience. Among the exotic flora found in the forests and grasslands here is the Neelakurinji a flower which bathes the hills in he blue colour once in every twelve years. The Neelakurinji, will bloom next in 2006 AD. Munnar also has the highest peak in South India - Anamudi - which towers over 2695 M and is an ideal spot for campers who would like to trek.